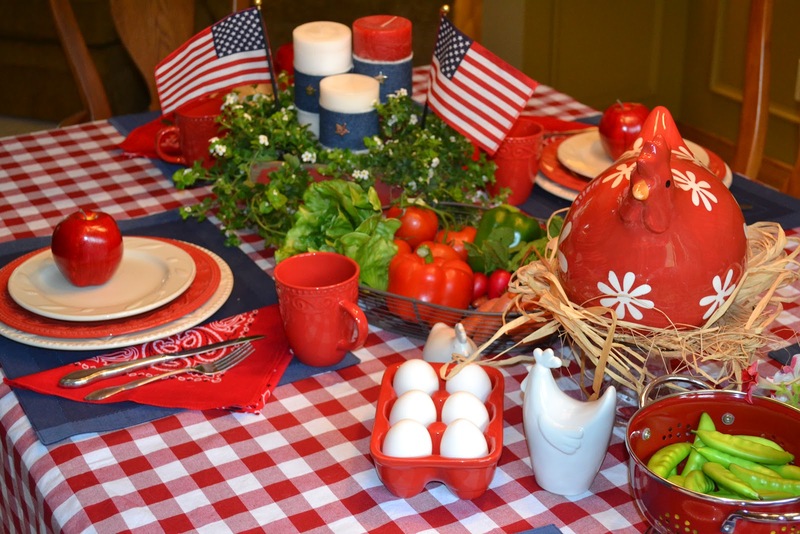 I am celebrating the 4th with a sentimental trip to my farming days! We used to spend the summer working the gardens at my grandmother's and selling our vegtables at a roadside stand. 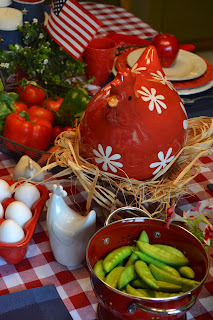 What started my inspiration was the Hen! I saw her in a shop down in Amish Country, didn't buy her, started on my way, got about 2 miles down the road and turned around to go back and get her! She was just too cute to pass up. I also bought the litttle white rooster and hen at the same shop. 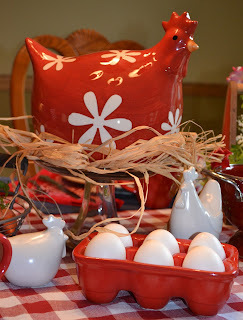 I found the red ceramic egg carton on sale at Target. We sold green beans, carrots, peppers, and tomatoes. July Fourth is too early for corn on the cob around here - we used to say "knee high by the 4th of July". I banded my candles with some denim I ripped in strips to get those frayed white edges and added some button stars, flags, and white flowers. At the other end of the table I placed some flowers in a Coca Cola wood box I picked up at Walmart. 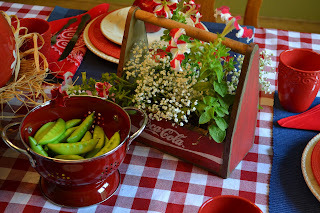 I loved the little red collander from Marshalls, which I filled with snap peas. 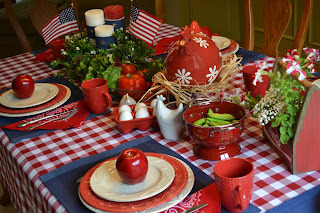 I used red bandanas from Hobby Lobby as napkins, and the tablecloth was something I had - I believe it was from Kohls. Half of the fruits and vegtables I used on this tablescape are real and the other half are fake! Can you spot the imposters? I hope you all have a wonderful time celebrating our great nation's independence! I love the red and white check and bandana napkins. Beautiful 4th of July table! 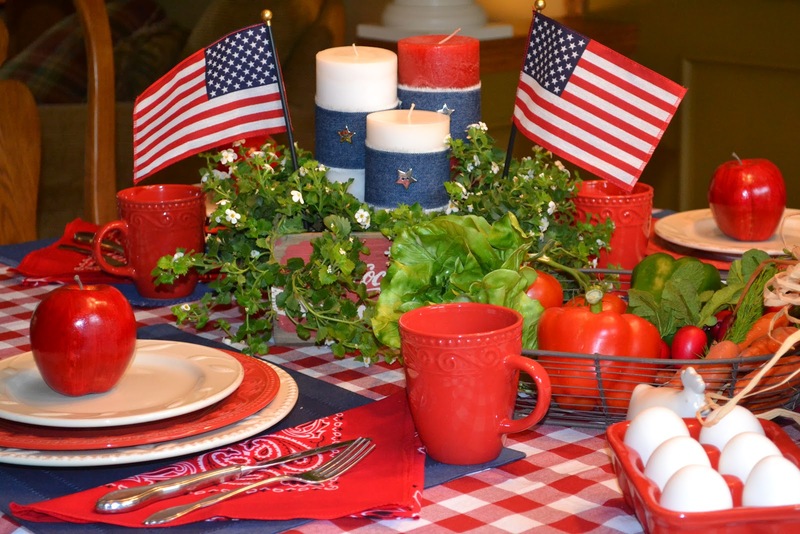 All of your red, white, and blue makes me smile. Oh it is so cute... what a pretty table. 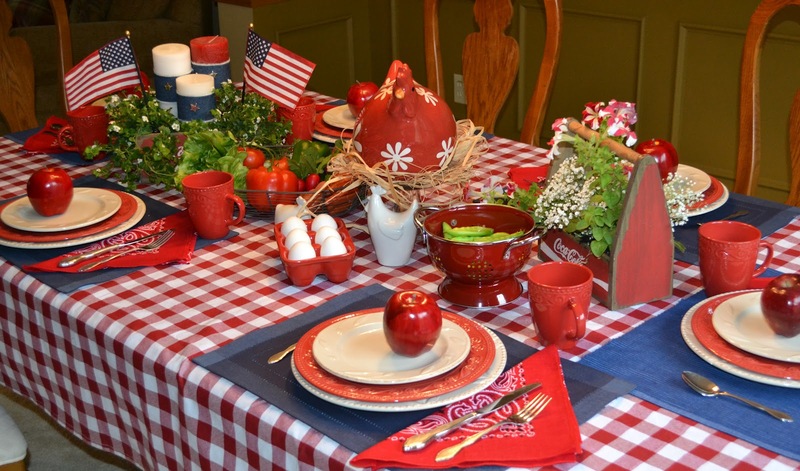 What a fabulous patriotic table! I love that rooster & would have turned around to go back & get him too. So fun! Great to have you be a part of Seasonal Sundays. 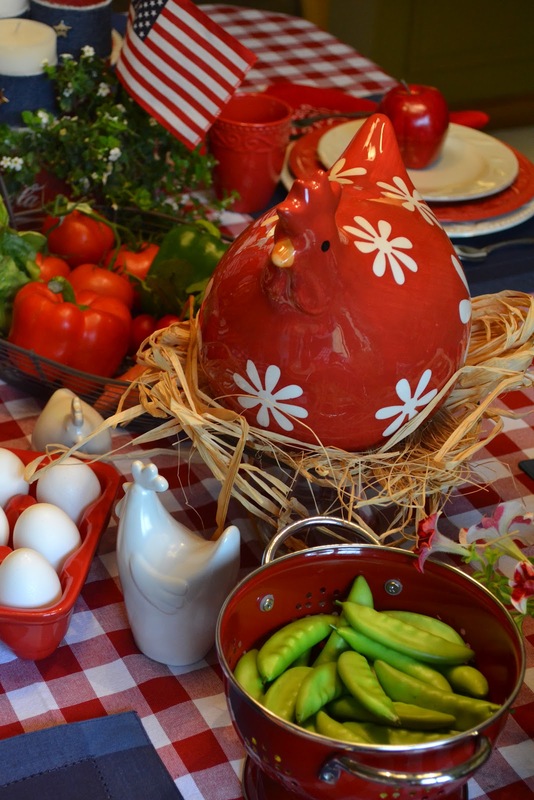 Great table and love the rooster and eggs. 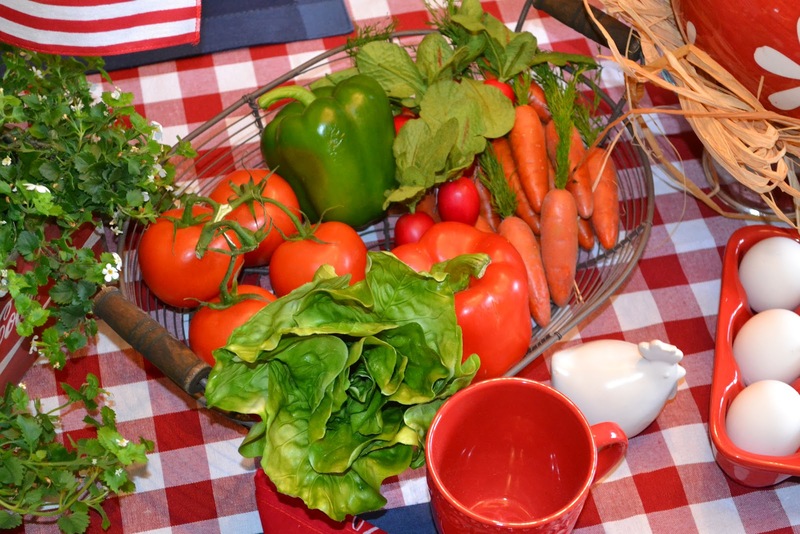 Nothing better than fresh summer veggies for the 4th! I've turned around and gone back too at times. Good choice! Where in the world do you store all your cute finds?? You must have a attachment on your garage LOL!!! Did someone say rooster?Gosh how cute is your table. I love it. Thanks for your sweet comment too on my blog.